Finally a tasting (in fact two) of truly sour homebrew. This is a split batch that was started in August 2006 with WYeast's Roeselare Blend, that I first posted about last April. 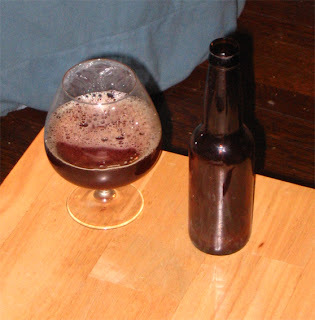 It is also the first of my beers aged with a toasted chairleg in the neck of the carboy. The first beer is a straight Flanders Red which was bottled last August, while the second beer is the second half of that same batch aged on 4 pounds of blackberries for 4 months and was bottled at the end of December. Aroma - Upfront it is a combination of cherries with a bit of barnyard funk. There are also some nice floral notes that must be coming from the Brett continuing to create esters from the alcohol and acids. No acetic/vinegar character, which is fine by me. Appearance - Light amber/orange/red depending on how much beer I am looking through. There is a bit of haze, but it is a pretty clear beer. It still hasn't developed much carbonation as it just barely manages to put up some patch bubbles. However, this mini-head has surprisingly good retention. Taste – Moderate soft sourness, that spreads out evenly over the palate. In addition to the variety of fruit flavors, there is also a nice vanilla/oak component. The finish lingers a bit, but it does not stay as long as most of the sharply sour/sweet commercial versions I have had. Again there seems to be no sharp acetic acid, just nice tangy lactic acid. It could use a bit more sourness and sweetness for the "style" but I think it retains balance since both are below standard levels. Mouthfeel – Very light carbonation, the low carbonation causes the body to seem thinner than it should. I believe this is a result of CO2 escaping before the beer was bottled. In the January-February issue of BYO Vinnie from Russian River suggested over priming barrel aged beers because most of the carbonation escapes during aging process, leaving it as still as wine (at bottling time beer normally has a bit less than 1 volume of CO2 still dissolved in it from fermentation). I believe this theory is confirmed by the Blackberry half of this batch which had active fermentation and achieved sufficient carbonation. Drinkability/Notes – This is a solid beer, and mild enough considering it is unblended, but it could certainly benefit from some added carbonation, complexity, and sourness. I think it is one of the better funky beers I have made, and very drinkable for the style. Aroma – Big fruity/sour nose. I think the bigger nose on this one is due in part to the added fruit, but also in part to a higher level of carbonation. The same floral notes from the straight batch remain adding some nice complexity to the nose. This beer also has a hint of vinegar, but still nowhere near the level of many commercial Flanders Reds. Appearance - Deep-amber/burgundy. There is a thin white head, but retention is pretty poor. Hazier than the plain batch, but that is expected as it has only been in the bottle for a few weeks. Taste – Bright acidity upfront, deep earthiness in the back. Not too dry, there is a good fruity sweetness. Not much blackberry flavor, it is there but it definitely tastes fermented, not like fresh fruit. Much more sour and complex than the straight batch, I'm glad I didn't lower the amount of berries as I was considering doing. 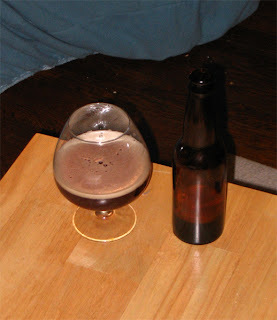 Mouthfeel – Solid carbonation, the body certainly feels a bit more substantial than the plain version. Once the beer went onto the blackberries it received a standard airlock, this kept some CO2 in the beer and made the same amount of priming sugar give me much more carbonation in the final beer. Drinkability/Notes – Delicious! I think it is much better than the plain half, and probably one of the tastier beers I have made to date. I think with a bit more age it will be hard to determine what is fruit and what is fermentation character, I think it is very nice that the beer shines through as well as it does, that was my main concern when adding fruit to a base beer that I had waited so long to mature. Sounds like some good stuff. Congratulations. This batch is one of the first that has seriously made me consider stepping up to a 10 gallon system. Getting only a case of each after 18 months of waiting has forced me to already start hoarding the bottles of each. I’m sure I’ll have the same problem after I split a batch of Lambic next summer, and a batch of Flanders Pale next Fall. 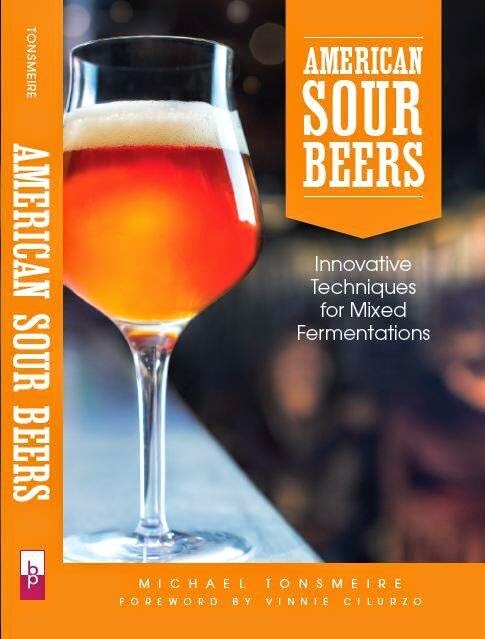 I've always loved sour beers. Never planned to do one myself but I've been reading up more and more on them and man ... I can't wait to try one myself. I appreciate sites like yours that have good, practical info on them.